This year, many of your favorite Disney•Pixar stories will take center stage at the Disneyland® Resort! Starting Apr. 13, 2018, a one-of-a-kind celebration called Pixar Fest will begin! This limited-time event will featuring the debut of an all-new nighttime spectacular, the return of two fan-favorite parades, new Pixar experiences, and entertainment. Together Forever – A Pixar Nighttime Spectacular will light up Disneyland® Park with dazzling pyrotechnics and amazing projections at iconic park locations like Sleeping Beauty Castle, the water screens of the Rivers of America, the façade of “it’s a small world” and the buildings of Main Street, U.S.A.
Pixar Play Parade will make its debut inside Disneyland® Park for the very first time with new show elements – the Pixar lamp, and Characters from Up and Inside Out. Paint the Night parade returns to the Disneyland® Resort, making Disney California Adventure® Park its home! This mesmerizing procession will spotlight many Pixar stories, including characters from Toy Story, Monsters, Inc. and Cars—in addition to an all-new “The Incredibles” float joining the parade later in June. And on June 23, the area that was known as Paradise Pier at Disney California Adventure® Park will be transformed into Pixar Pier! This new land will introduce four whimsical neighborhoods and a transformation of the old California Screamin’ to the new Incredicoaster! Neighborhood #1 inspired by Disney·Pixar’s “The Incredibles” involves a transformation of California Screamin’ to the new Incredicoaster where the Parr family races alongside guests in an attempt to catch baby Jack-Jack! 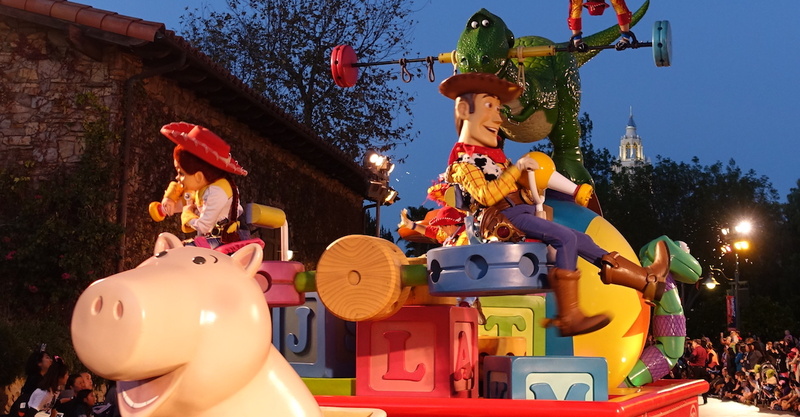 Neighborhood #2 inspired by Disney•Pixar’s “Toy Story” will be developed around the popular Toy Story Mania! attraction. Neighborhood #3 inspired by Disney•Pixar’s “Inside Out” will introduce a new and yet unannounced family-friendly attraction that will open at a later date. Neighborhood #4 will include Mickey’s Fun Wheel and will celebrate a collection of favorite Pixar stories. Mickey’s Fun Wheel will get a new look with each gondolas showcasing a different Pixar character. The Games of the Boardwalk will also be refreshed to match the new theme. Ariel’s Grotto restaurant and the Cove Bar will be transformed into a Pixar-themed lounge. All of the remaining areas of Paradise Pier will become a new land called Paradise Park. NOTE: To prepare for the changes to Pixar Pier, California Screamin’, Mickey’s Fun Wheel, Games of the Boardwalk, Sideshow Shirts, Ariel’s Grotto and Cove Bar are now closed! We’re really excited to experience these changes coming to the Disneyland® Resort! 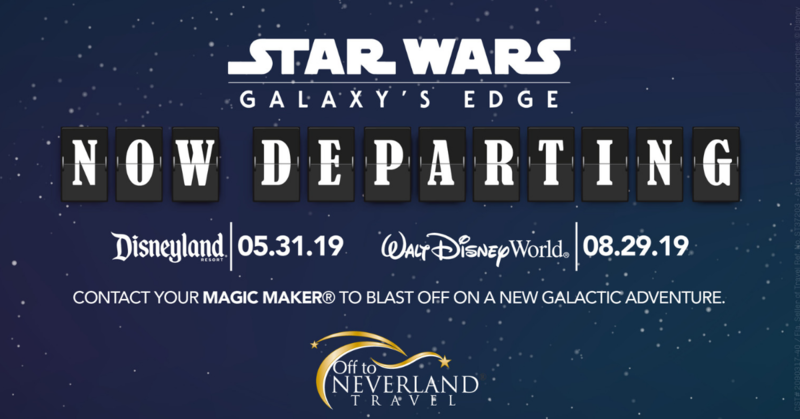 Contact your Magic Maker® today to start planning your vacation To Infinity and Beyond! On July 19th, Disneyland® Resort will launch a new service called Disney MaxPass inside their parks! Disney MaxPass combines two popular Disneyland® Resort services to help your day in the parks be as magical as it can be. Disney PhotoPass – Disney MaxPass gives you unlimited downloads of all your Disney PhotoPass photos from your day in the park. This includes photos taken on select attractions, during select Character dining experiences, and even all normal and Magic Shots taken by Disney PhotoPass photographers. 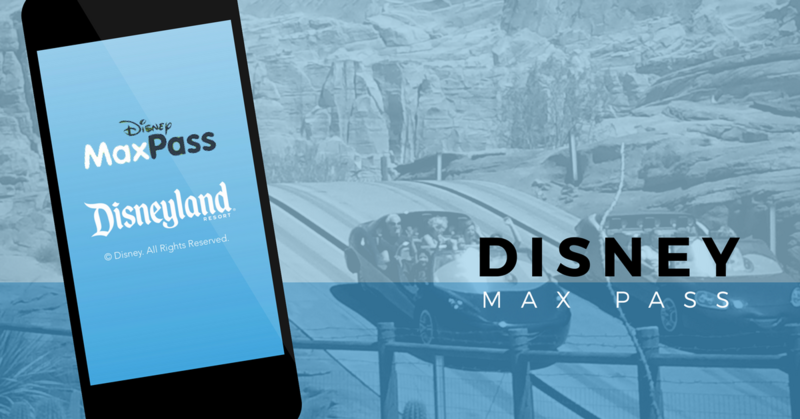 Disney FASTPASS – Disney MaxPass also enables mobile FASTPASS booking and redemption times via the Disneyland® app. No more walking over to the attraction – simply make a FASTPASS selection (subject to availability) using the app and then scan your code at the entrance when it’s time to experience the attraction! Disney MaxPass will be offered for an introductory price of $10 a day (additional pricing options available for Disneyland® Resort Annual Passholders) and can be added in advance or once inside the park. The option of using the existing Disney FASTPASS service at the kiosks is still available at no additional cost. You are strongly advised to check the day’s FASTPASS ticket availability and other Park details before purchasing Disney MaxPass or using a Park ticket with Disney MaxPass as FASTPASS tickets for your preferred attractions may not be available at the time of purchase or use. FASTPASS tickets are limited and availability is not guaranteed. FASTPASS tickets may be obtained only while you are in the Parks and may not be available for entertainment through Disney MaxPass. An experience that does not have Disney FASTPASS® availability at a kiosk will not be available using Disney MaxPass. The Disney MaxPass benefit will expire at the end of the day or when the Passport it is associated with expires, as applicable. Disney MaxPass is nonrefundable, nontransferable, may not be redeemed for cash and is subject to other restrictions. Price, terms, entitlements, attractions and entertainment are subject to change or cancellation without notice. Passholders who purchase the Disney MaxPass benefit may not use the value of any separate ticket media toward the purchase price of Disney MaxPass. Disney PhotoPass service is subject to the PhotoPass terms. Online registration required. Disney PhotoPass Photos captured during the day your Disney MaxPass is used or during the validity dates of your Passport, as applicable, must be linked to your Disney account and may be downloaded pursuant to the expiration policy. Not responsible for missing, lost or damaged photos. Downloads are restricted to personal use by Disney account holder only and may not be used for a commercial purpose. Subject to restrictions and change without notice. Last night, Disneyland® Resort announced that they will be adding three sensational new nighttime spectaculars to their offerings! 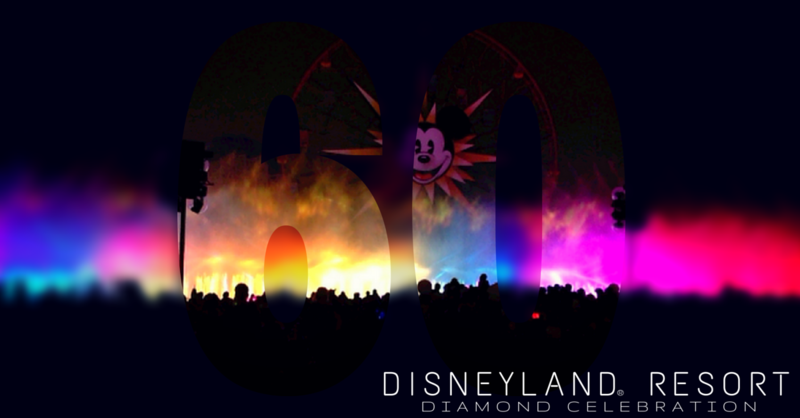 Beginning Fri., May 22, 2015, you will be dazzled with a new nighttime parade, fireworks spectacular, and a new “World of Color” show. Built off of the latest technology and immersive special effects, the three new shows promise to expand the boundaries of after-dark entertainment like never before. When Mickey Mouse uses his imagination to harness the power of Tinker Bell’s pixie dust, the result is the “Paint the Night” parade! “Paint the Night” will flood Main Street, U.S.A. with vibrant color and more than 1.5 million LED lights! The luminescent parade will bring many of your favorite Disney stories to life – including Monsters, Inc., Cars, The Little Mermaid, Beauty and the Beast, Toy Story and Frozen. The longstanding Disneyland® Resort tradition of creating dazzling fireworks shows soars to new levels with “Disneyland Forever.” Innovative project mapping technology and other special effects will be used to immerse you into the worlds of beloved Disney and Disney●Pixar films. Many familiar Disneyland® Park icons will become the “stage” of the show – including Main Street, U.S.A., “it’s a small world,” Rivers of America and the Matterhorn. “Disneyland Forever” will be visible from Main Street, U.S.A., and several other locations throughout Disneyland® Park. In addition, both the iconic Sleeping Beauty Castle in Disneyland® Park and Carthay Circle Theatre in Disney California Adventure® Park will glisten and gleam for the celebration, each with its own diamond medallion. Diamond Celebration décor, festive banners, creative merchandise and specialty food items/menus will also be found throughout the Resort area. All of the fun begins on May 22, 2015! We expect more announcements to be made in the coming months on the Diamond Celebration. We’ll keep you posted on the latest as the information becomes available. To celebrate the upcoming May 3rd release of Iron Man 3 to theaters, Disneyland® Park has opened a new exhibit inside Innoventions. Debuting just this past weekend, the Iron Man Tech Presented by Stark Industries exhibit brings guests up close and personal with set pieces from the upcoming film. The centerpiece of the display is Tony Stark’s Hall of Armor which features Iron Man suits Mark I-VII along with the newest suit, Mark 42. 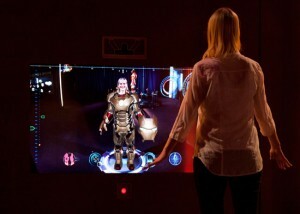 Guests can also use special simulation technology to virtually “suit up” and try out the newest Iron Man armor. The Iron Man Tech Presented by Stark Industries exhibit is scheduled to run through Sep. 2013 and requires regular theme park admission to Disneyland® Park. Late last summer, Disneyland® Park closed the Princess Fantasy Faire to renovate the Fantasyland® Theatre for a new theatrical stage show. During his adventure, Mickey will encounter classic Disney characters like Pocahontas, Mulan, King Louie, and Princess Tiana. At this time, no official dates have been set for the opening of “Mickey and the Magical Map,” but we will keep you updated when that becomes available. All artwork are conceptual renderings. Actual construction/production may vary. The Disney Princess experience will soon change at the Disneyland® Park when the new Fantasy Faire opens to guests on Mar. 12, 2013! An extension of the current Fantasyland®, Fantasy Faire will bring some of your favorite timeless tales to life! Located in the former Carnation Plaza Gardens in the shadows of Sleeping Beauty Castle, this expansion is an enchanting, immersive area for anyone who treasures fairy tales. 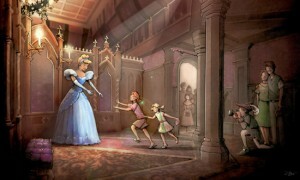 Inside Fantasy Faire, visitors will find the Royal Hall, a meet and greet area where many Disney Princesses await them. In the charming village square is Tangled Tower. At the Royal Theatre, enjoy two different shows telling the tales of Rapunzel (Tangled) and Belle (Beauty and the Beast) presented by a pair of vaudeville-style Renaissance storytellers. Fairytale Treasures is a shop found inside Fantasy Faire that will offers all kinds of Princess merchandise. And finally, Maurice, Belle’s inventor father, has transformed an old gypsy wagon into a colorful food cart, Maurice’s Treats, serving a new signature beverage, the Boysen Apple Freeze, along with bread twists – cheddar cheese garlic and strawberry almond cream flavors. Let us help plan your next trip to the Disneyland® Resort! Contact your Magic Maker® and find out how the “Happiest Place On Earth” just got happier! 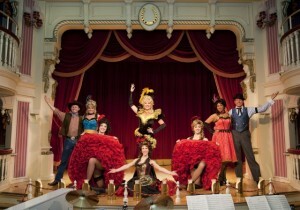 To reserve a seat for the performance, proceed to the podium outside of the Golden Horseshoe on the date of your selected performance. Tickets will be issued for your preferred show time based off of availability. Your ticket will indicate a time for you and your party (up to 8 guests) to return to be seated for the show. 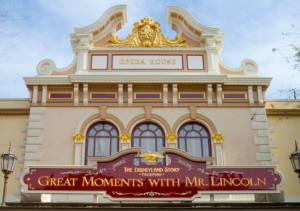 Because tickets are being distributed on a first-come first-served basis, we suggest you arrive at the Golden Horseshoe early in the morning for best availability. 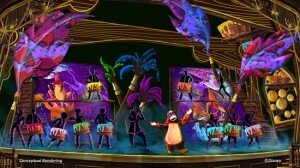 Each show will have a stand-by queue to fill in seats in the case of a “no show,” but admission is guaranteed to only those guests with a ticket. 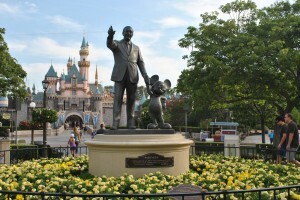 When Walt Disney opened the gates to Disneyland® Park 57 years ago today, no one imagined it would be what it is today. Even though Walt encountered many obstacles and was told numerous times that he was making a grave mistake, he continued to follow his dream. Today, more than 500 million guests have visited Disneyland® Park, becoming a source for memories that will last a lifetime! 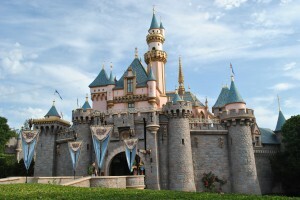 Disneyland® Park, “The Happiest Place on Earth,” occupies 85 acres of land about 27 miles southeast of Los Angeles. Disneyland® Park features 8 themed lands – Main Street, U.S.A®, Tomorrowland®, Fantasyland®, Frontierland®, Critter Country, Adventureland®, New Orleans Square, and Mickey’s Toontown. When Disneyland® Park opened on July 17, 1955, it had 18 major attractions. Now, guests will find more than 60 different adventures and attractions! It takes approximately 5,000 gallons of paint each year to keep Disneyland® Park looking as beautiful today as it did 57 years ago. Each year, more than 1 million annuals are planted at Disneyland® Park. Approximately 30 tons of garbage is collected each day in the Park. No visit to Disneyland® Park is complete without food! Each year, an estimated 3 million hamburgers, 2 million hot dogs, 1.6 million servings of popcorn, and 2.8 million churros are served. The Costuming Department is responsible for approximately 800,000 pieces! Annually, about 300,000 buttons are replaced on costumes! Each night, custodial cast members wash and steam clean the streets of Disneyland® Park. The Disneyland® Band has marched more than 3,500 miles in over 90,000 performances since opening day in 1955. The repertoire of the band includes more than 400 musical numbers. What is your favorite part of Disneyland® Park? Tell us in the comment section below! Guests visiting Disneyland® Park will notice new venues and shows and some new looks for some of their favorite attractions. 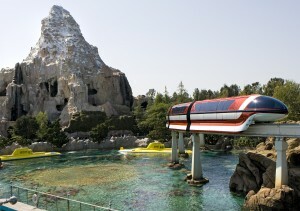 The Matterhorn Bobsleds, a Disneyland® Park landmark since 1959, just reopen following a five-and-a-half month refresh of the attraction. The mountain has new paint and “snow caps” on the outside and some lighting changes inside. A new three-person bobsled will allow guests to be seated individually. The mountain climbers will also return from their hiatus this summer to thrill guests as they scale the Matterhorn slopes. The weather will be changing in Pixie Hollow this fall when a new fairy arrives to visit Tinker Bell. Frost fairy Periwinkle, from the upcoming Disney video Tinker Bell: Secret of the Wings joins Pixie Hollow, but not without some changes. Tinker Bell’s snow-making machine will be added to help keep Periwinkle cool. In Frontierland®, the newly premiered Big Thunder Ranch Jamboree brings music, dancing, crafts, pin trading and plenty of Disney characters (in Western wear) to the space previously known as Festival Arena. 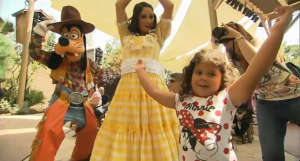 Guests may join in and kick up their heels with Billy Hill and the Hillbillies at an old-fashioned Cowboy Roundup or gather to enjoy live performances by visiting schools and community groups, presented by the Disney Performing Arts Program. The west side of Main Street, U.S.A.® Area now features an array of refreshed shops and restaurants. All of their turn-of-the-century interiors are newly redecorated with period signs, lighting fixtures and woodwork. Guests visiting Carnation Café can now enjoy indoor as well as outdoor seating. New menu items include apple-granola pancakes and huevos rancheros for breakfast, plus fresh fish and Walt Disney’s favorite beef-and-pork meatloaf for dinner. Beloved Carnation Café cast member Oscar Martinez will continue to greet guests as he has for more than five decades! Gibson Girl Ice Cream Parlor has expanded its scooping space and added registers, all the better to serve guests. The menu includes classic sundaes and new ice cream floats. 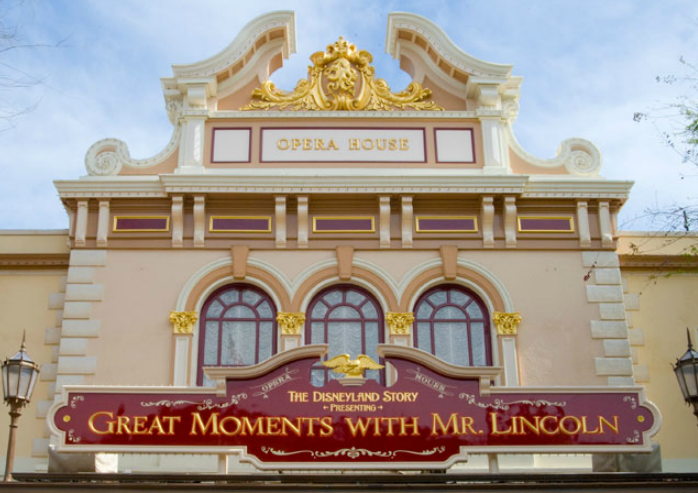 The Penny Arcade has returned with vintage games and silent movie Mutoscope viewing machines, plus the mystical fortune-telling Esmeralda and the classic Welte Orchestrion organ-and-percussion music machine, purchased for Disneyland® Park by Walt Disney himself. The expanded kitchen at the Candy Palace allows guests to watch two kinds of candy being prepared at the same time. The Candy Palace is still making all the favorites like caramel and gourmet candy apples, toffee and fudge, and the extremely popular handmade candy canes made each holiday season. Jolly Holiday Bakery Café, which opened in early 2012, has become a popular stop for breakfast, lunch or dinner on Main Street, U.S.A.® Their menu features baked goods, sandwiches, salads and beverages and the whimsical décor of “Mary Poppins” adds to diners’ enjoyment. In the Main Street Opera House, the Voices of Liberty, an a cappella vocal group inspired by the popular Voices of Liberty at The American Adventure attraction in the Walt Disney World® Resort in Florida will perform patriotic songs to entertain guests awaiting the “Great Moments with Mr. Lincoln” presentation. Lastly, Disneyland® Park fans, dedicated gardeners and admirers of the Resort’s landscape will all want to experience the Cultivating the Magic Tour, which explores Disneyland® Park horticulture. Presented by a Resort Tour Guide, the tour explores landscaping highlights of the park from the “Flower Mickey” at the Main Gate to the spectacular plantings in the Jungle Cruise and Storybook Land.